Destroys itself quickly when tipped over. The Jetboil SOL TI is the best stove on the market if your chief concerns are a compact water boiler with absolute maximum fuel efficiency. It’s more fuel-efficient and lighter than the Primus EtaExpress and MSR Reactor and better in wind than the Primus (but not the MSR). However, it’s very pricey, and has odd quirks (like a lack of a functional handle when pot is hot). The Jetboil SOL TI is compact enough to get lost in a loaded mountaineering pack. The pressure regulator keeps boil time consistent until the last few drops of gas and its strainer lid holds tight for sipping and draining (although Jetboil strongly urges users to not cook anything in the stove). The single serve .8 liter titanium cup gets too hot to handle after boiling, so either let it sit for a few minutes or find a way to pour while its still attached to the burner base and fuel canister. The neoprene wrap also helps keep the contents warm. A functional handle that doesn’t require you grabbing the hot neoprene would be nice. The Jetboil SOL TI also comes with a pot adaptor for use with non-brand pots and the company’s folding stove stand to attach to fuel canisters. 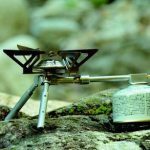 You could also buy a hanging kit to suspend the stove within your tent or vestibule when perched cliff-side for the night, making it an ideal stove for small spaces. However, given how hot the pot is after boiling, be extra careful when it’s dangling above your sleeping bags. The Jetboil SOL TI uses a built-in piezo igniter that didn’t fail (so long as its dry) and flame control is accurate and easy to manipulate. The pot locks with a turn on to the burner base. The Jetboil SOL TI excels in this category. At 12.3 oz. with everything except fuel, it’s much lighter than the Primus EtaExpress and MSR Reactor. The competitors weighed in at 1 lb 3 oz. and 1 lb 8 oz., respectively. The Jetboil SOL Ti was the most fuel-efficient stove in our test. It can boil 12 liters of water on a 4 oz. canister of isobutane and propane—a 33-percent improvement over the MSR Reactor and Primus EtaExpress. 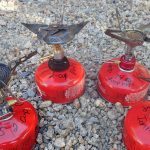 The other stoves tested bubbled only nine liters each on the same fuel mix. The Jetboil SOL T- performed well in wind, boiling .75 liters of water three times at an average of 3:30, although slower than the MSR Reactor, which did it in 3:08. The EtaExpress averaged 4:14. The wind was constant between 10-18 mph and gusts hit 20 mph. The Jetboil SOL TI is not as fast as the MSR Reactor but does boil .75 liters of water faster than the Primus EtaExpress. Over ten cycles, the Jetboil averaged 3:12 with water temperature at 41.5˚. Under normal conditions, the stove is as durable as the others, although you need to take care not to smash the heat exchanger fins (which are on the outside of the pot) if you discard the fin protectors. When used normally, the SOL TI demonstrated no unusual durability issues. It was kicked around, dropped and stuffed into packs. It’s important to ensure this stove is never allowed to burn while empty. Without water to help distribute heat, the flame can quickly damage the heat exchangers and other parts of the stove. Our advice? Don’t tip your Jetboil over. And if you do, pick it up quickly and shut it off.